I would say that Among Others is a gentle version of fantasy. I wasn’t overwhelmed by magic or fairies or unicorns or wizards. It is a book about a girl who has a mean mother (a witch, in fact), who has lost her sister, and who has come to live with a father that she doesn’t know. For me, the magical elements were not the reason I liked the book, although they did add some extra interest and unpredictability to the story. I liked that the magic was explained as a “chain of coincidence” rather than as something that happens out of the blue. One of the things I’ve always liked about science fiction is the way it makes you think about things, and look at things from angles you’d never have thought about before. Mori’s father and three aunts have sent her to a boarding school, Mori believes to get her out of the way. What I liked most about the book were the experiences she had at school, with the other girls, with the people in town, at the library, in the book club she joins, with the school librarian, and with her father and his family. It’s depressing how much boarding school is just like Enid Blyton showed it, and all the ways it’s different are ways it’s worse. Mori’s been separated from her mother’s family in Wales, who she still longs for, she is grieving for her sister, and she now has all this new stuff to deal with. All of this has been written about before – there are many ways it could go – but adding the magical elements gives it a twist. Magic isn’t inherently evil. But it does seem to be terribly bad for people. Personally, I could have done with less magic and fairies and more character development. 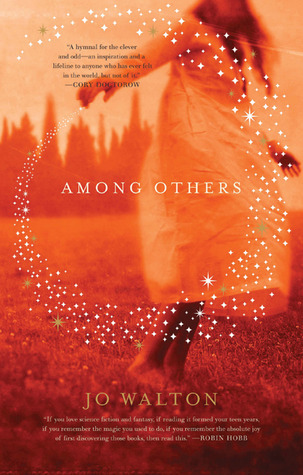 Mori was curious about her father, aunts, and paternal grandfather – she wanted to know more about them – and so did I. For the length of the book, I don’t feel like I ever got to know the “who” or the “why” of things. I did, however, enjoy the bookishness of this novel. Mori is constantly reading or thinking about reading, or telling us about the books she’s read and comparing them to each other. She belongs to a science fiction book club at the library, and she is always putting books on hold and picking them up. Most of the books she talks about are science fiction, some of which I had never heard of (plus it was 1980, so older science fiction, but who doesn’t love Lord of the Rings?). She writes letters to her father about the books she reads (he loves science fiction, too), and he sends her money to buy more books. I was thrilled when, on page 19, she mentions Jane of Lantern Hill. I can bear anything as long as there are books. There are some awful things in the world, it’s true, but there are also some great books. Interlibrary loans are a wonder of the world and a glory of civilization. Libraries really are wonderful. They’re better than bookshops, even. I mean bookshops make a profit on selling you books, but libraries just sit there lending you books quietly out of the goodness of their hearts. Among Others is written as Mori’s journal. I liked reading about her day to day interactions (like eating honey buns and tea at the local cafe, and getting soap-on-a-rope as a gift from her aunts) as well as the bigger picture of her past and her fears for the future. I think it’s a great book for the YA crowd. I have already recommended Among Others to my daughter who loves science fiction (and books). And maybe it will inspire her to read some sci-fi classics. Have you read anything by Jo Walton? Are you a sci-fi/fantasy fan? Are there other Welsh-Canadian writers you would recommend? I read this book for the Wales Readathon hosted by Paula at The Book Jotter. Be sure to check out other contributions to the event! 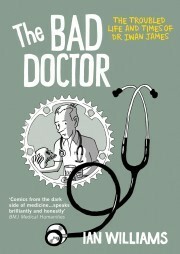 After reading Rebecca’s review of The Lady Doctor by Ian Williams, I put a hold on his first book, The Bad Doctor, surprised (but happy) to see it at our library. It was only while I was reading it that I clued in to the fact that it’s set in North Wales. The author, Ian Williams (not to be confused with the other Ian Williams), lived in North Wales for twenty years after studying medicine in Cardiff. All I really need to say about this book to recommend it is that I read it. The whole thing. Of course I’ve read all the Captain Underpants books and Diary of a Wimpy Kid, but until now I hadn’t read a graphic novel for adults all the way through. I think what did it for me was the medical aspect. So, although I might not start picking up graphic novels willy-nilly, I just might pick up more by Ian Williams, or others with a medical theme. What’s not fascinating about reading stories of the variety of patients that walk through a doctor’s door? I’ve read most of Jo Walton’s books I think. I like how she is always trying something different. And her bookishness often shows through, most definitely in this book! I agree about wanting a bit more character development. I was left somewhat unsatisfied, though I enjoyed it and would read it again. I hope I wasn’t complaining too much, because I did enjoy it the whole time I was reading it! And, yes, it seems as though her books are very different from each other. From what I read of her, she sounds like she writes for her own enjoyment more than anything else, which really shows! Wow, your very first graphic novel! I’m so pleased I was able to point you to one that you enjoyed. Along with the sequel to this one, as medical-themed graphic novels go I would recommend Last Things by Marissa Moss. I’d heard of Jo Walton but wasn’t sure if I would enjoy her stuff (like you, I’m pretty reluctant to pick up standard sci-fi). I think there are elements of this that I would really like, such as the boarding school setting and being part of a book club. I seem to recall that my library has a copy, so I might give it a try sometime. I didn’t know you had an Annapolis in Canada! When I last lived in the States, Annapolis, Maryland was the next town over. I hope you enjoy it. It’s a lot sadder than Williams’s book, but that comes with the territory. As Lory said, I like how Walton is always giving us something with a slight edge or twist to it, like the very ordinary, but with a subtle difference. So I might enjoy this one too, given I’ve enjoyed her writing. And welcome to the graphic novel club. There are some really interesting ones out there. 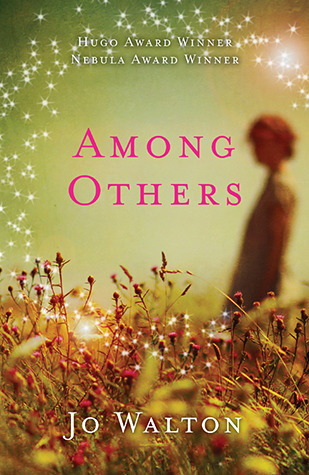 Do you have a favourite Jo Walton novel to recommend? Not off the top of my head, as I mostly read her short stories over on Tor.com, and follow her there. I just love how she’s so inventive in her characters. And yeah, it’s a case of finding the right kind of graphic novels. I’ll look at some of my titles and pass them along. I’ve gone through sci fi/fantasy phases, but it’s not really my genre. Her name sounds familiar, too, but when I looked at her book titles, none of them rang a bell. The one I read didn’t seem to be full-on sci-fi/fantasy. I don’t know what her others are like. I’m not one to pick up sci-fi/fantasy books either, although I have read Jo Walton’s “Small Change” trilogy (Farthing, Ha’Penny, & Half-Crown which is an alternate history. I loved them and if I was younger, I’d pick up Among Others. Thanks for your insightful review! Oh, alternate history sounds interesting! I just can’t get on with anything involving magic or witches or unicorns……. I usually can’t, either. I didn’t mind the human magic, but I have to admit I could have done without the “fairies”. I hope the classics your daughter moves on to include Ursula Le Guin. I prefer straight SF but Le Guin did both and she’s a must-read IMO. Girls’ school fiction is not my thing, though I did review one recently, so I’ve nothing to add there. Read “My Real Children”by Jo Walton…completely different kettle of fish and in 66 years of reading one of my favourite books ever. I can’t stand the fairies,dragons etc brand of fantasy.MRC alternate reality/almost dystopian.Bought my own copy so I could keep the heroine close! Debbie, you don’t need to be younger to enjoy Among Others. We’ve pretty much all, at one time, been lonely and felt outcast, and when Mori finds her tribe, well, it’s just great. Naomi, I love this: Libraries just sit there lending you books quietly out of the goodness of their hearts. It’s definitely for all ages – I just couldn’t help but think how great it would be for teens as well even though it’s not marketed as YA. You know. I don’t even remember the magic parts of this book. It was the bookishness that sealed the deal for me. I hardly even paused in reading this one: I just loved it (though obviously, now I’m thinking that maybe I wasn’t paying quite enough attention, even if I was having a perfectly lovely time)! She has a book of essays and reviews about reading (all pulled from TOR online) but although I love her tone, I quickly became frustrated by the number of spoilers. I do want to read more of her fiction though! I quite enjoyed this one for the same reasons you did – and it will definitely be the bookishness of it that sticks with me! How the book ends is already fading away, but I don’t even think that matters! P.S. Thanks for clearing up the Ian Williams question for me: whenever I look up the “other” Ian Williams on GR, I’ve always been so confused by this. Also, bonus content: what fun. I loved that quote you included about libraries vs. book stores-so very true! I’m not a sci fi and fantasy fan (now) but I really enjoyed Among Others, which my best friend bought me on the recommendation of her then-young-teen daughters. I loved the book aspect of it all and the reminders of old friends of books from my own young teen years. I loved that part of it, too!